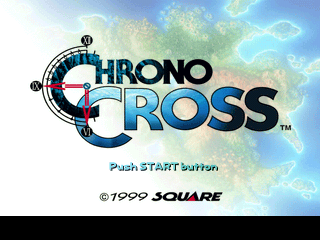 This page details one or more prototype versions of Chrono Cross. 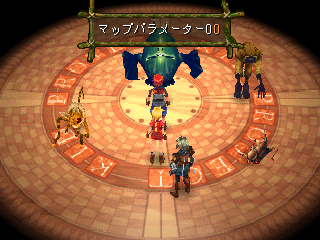 A playable demo of Chrono Cross was released on Square's Preview 5, which was included with the Japanese version of Legend of Mana alongside video previews of Vagrant Story and Threads of Fate and an interactive demo of Front Mission 3. Many things changed between the demo and final game, as can be seen by peering into the preview's assets. Simpler shading, details, and even sketches! 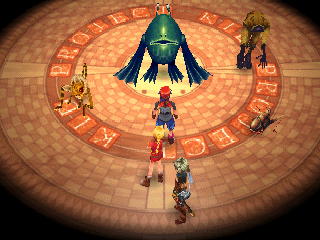 The demo starts at the game's beginning in the dream version of Fort Dragonia with a party consisting of Serge, Kid, and Glenn. 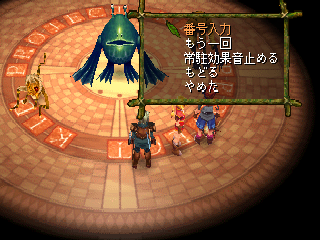 The party members are equipped with silver weapons and armor, Serge with a Silver Swallow which looks like the Mastermune (which he holds differently). Serge, Kid, and Glenn respectively are equipped with the accessories Power Seal, Magic Scarf, and Scope, none of which have descriptions. 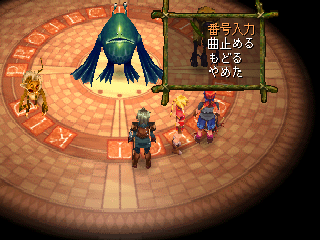 As soon as the party steps into the fort's main area, a Gobbledegook flies into their faces and attack them. 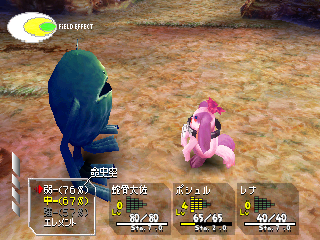 A series of tips are displayed throughout the battle at the beginning, when attacking, and when using elements for the first time. 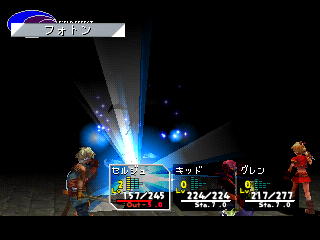 The enemies in the demo are much more powerful than the final. Gobbledegooks and Cat Burglars are present only in the demo. 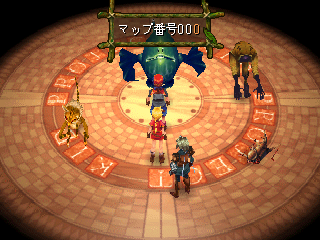 Treasure chests are scattered around containing some high-level elements. The crystal you must deactivate to finish the dungeon is guarded by a SideSteppa, who in the demo is Yellow innate. Killing it earns the party a star, which they already have 20 of. 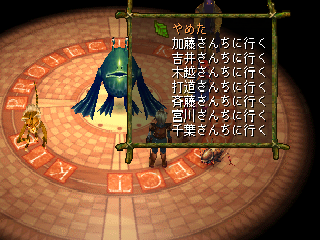 In Arni village, none of the hidden elements (or the frame in the vendor's pile of junk) can be found. 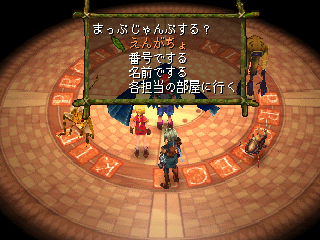 The "barrel" in the restaurant gives a Gravitonne; the chest in the next room contains HolyLight. The Heckran Bone isn't under the bed. 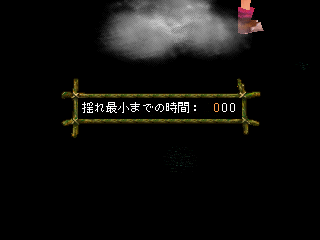 An NPC prevents you from accessing the section of the village where Radius is located. Outside of Arni, the world is mostly the same. Cape Howl is unchanged, Fossil Valley is inaccessible as per plot sequence. Divine Dragon falls doesn't have the option to enter. Hydra Marshes. Note the waterfall in the upper left isn't present in the final. "Evil dwarfs live in this hydra swamp. However, I　was foolishly captured by them." "But I am sorry to say that this is my only word to you in this trial version." "Sadly, it cannot be helped." "Well then. See you later, Serge." Upon entering Hydra Marshes, Razzly pops up to inform you the area is off-limits in the demo. Kid and Glenn rejoin Serge at Lizard rock to help him hunt for Komodo scales. Lizard Rock was altered slightly for demonstration purposes as well. 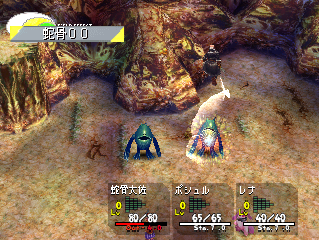 Opah Fish can be fought in addition to the regular critters, and the chests have different contents. Komodo Pups are green innate instead of Blue; Mama Komodo is white innate. Instead of showing up as soon as you kill her third baby, the boss appears when you take the upper left exit to Opassa Beach. As you leave for Opassa Beach, Kid and Glenn have some parting words, and run off. After the meeting with Leena at Opassa Beach, a series of non-interactive scenes play, and the demo is concluded. 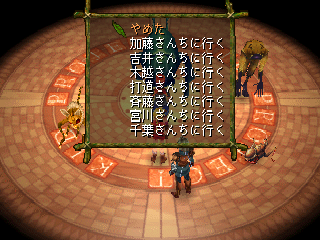 Running from battle simply fades the screen out; there is no running animation. The effect field of black element is purple instead of black. Screen transitions are much slower. Casting animations for elements are longer. 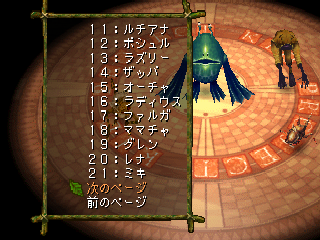 Healing elements always default to Serge, rather than the user. 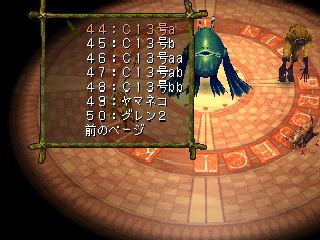 Using a hex editor to modify the party's element grids reveals a few things about the demo's elements: Most of them were changed, and a lot were deleted. 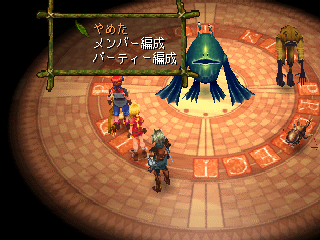 Several of the elements in the demo are slightly altered or entirely different graphically. 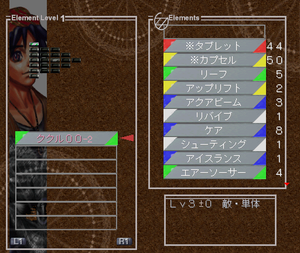 In the demo, the level 3, 5, and 7 techniques of every character except Serge and Glenn('s level 3s) are named in the format [character name] 00, 01, or 02. While this isn't particularly enlightening for the characters who did make it in the final, it does reveal a character who didn't make the cut. 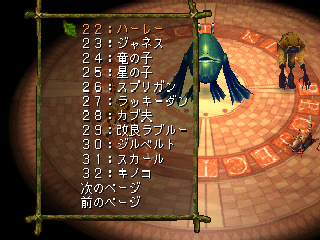 Elements 0601, 0701, and 0801 are named ククル00 (Kukuru) through ククル02. Using them yields the standard element placeholder effect of a low-damaging AquaRay on a single target, but with Kukuru's green innate. 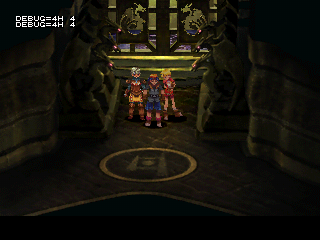 She is placed between Mel and Leah in the roster, which would explain the presence of a demo character portrait between the two where there are no members in the final. Since the only evidence that this character ever existed are a few placeholders, it's safe to say that she probably didn't make it very far into development before getting axed. 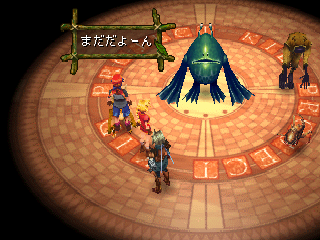 Though their assets were stripped away, coding for several monsters remains in altered form within the game's data. 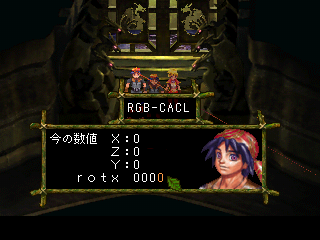 The Chrono Cross debug room managed to survive the conversion to the demo. 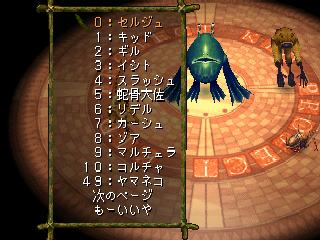 While it's not entirely functional due to most of the game's data being shaved off for the demo, most of the options are fairly explicit in their descriptions (assuming you understand Japanese)...unlike the debug room from, say, Final Fantasy VII. 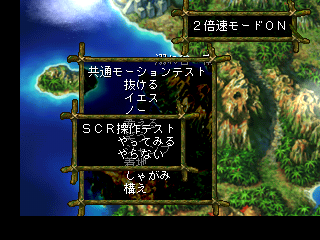 (Note that Guile's name here is listed as Magil, an artifact from when he was Magus from Chrono Trigger. His character data was overwritten with Glenn's, so you will get a Glenn clone if added to the party). 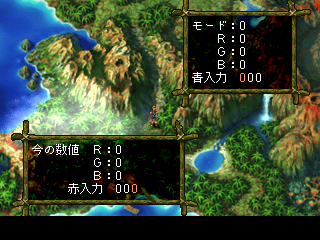 "Map parameter" Option 3: Map select menu. Only maps included in the demo can be visited, and the exits don't seem to function. 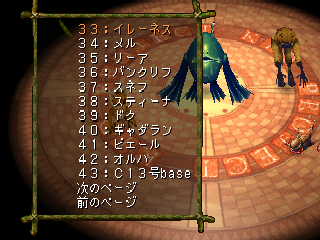 The only location normally inaccessible with any sort of functionality is Termina B. The rest of the menu consists of "go to (someone's surname)'s place" -- i.e., it's a list of stuff divided by name of the staffer who was in charge of putting it together. Same as BeachBum's 4th option. Although the data was stripped to the bone for the preview, there are a few things that can be done with the debug room normally not possible in the demo. Viper is essentially the same as he is in the final. 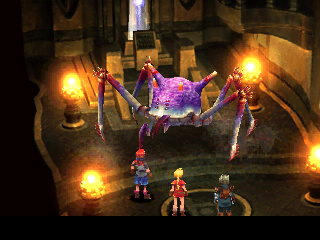 When added to the party, he's very weak compared to the demo version of Serge, Kid and Glenn, who were powered up along with the demo's critters. He's equipped with a Bone Sword and bone Armor. His Level 3 tech is partially functional, unlike Poshul and Leena's. He will jump in the air, spin around and slash his target, inflicting heavy damage. 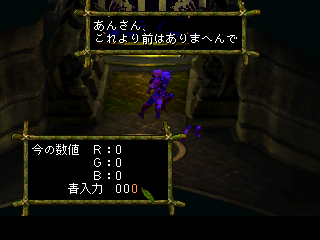 His model will stay in the air above the enemy for the rest of the battle after performing the attack. 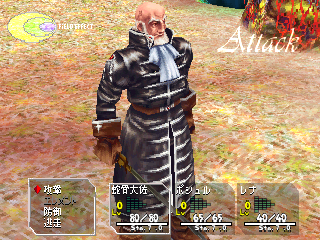 His level 5 tech fires a powerful yellow-elemental AquaRay at the target. Poshul is similarly weak, and equipped with Bone Armor and a Bone Fang (in the final, he uses Glove weapons, and 'Fang' weapons don't exist). 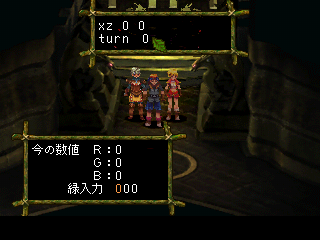 Attacking results in a placeholder sound effect of a woman's voice, saying "Zero", "One" through at least "Five" depending on which effect is supposed to play. Neither of Poshul's personal elements are complete, and both function as yellow-elemental AquaRays. Leena is equipped with Bone Armor and a Bone Pan, which is untextured (likely because the texture was cut for the demo). 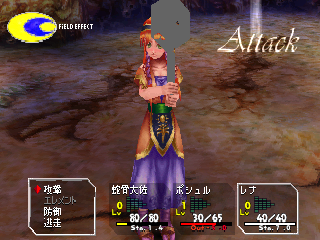 However, it still clips through her head partially. Like Poshul her level 3 and 5 techs are AquaRays, though blue element in her case. 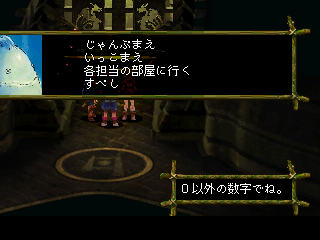 Unlike the other playable characters she doesn't have a proper casting animation for AquaRay and will bend over backwards when using it. As a rule, music in the demo sounds slightly crappier that what was used in the final, mainly due to the addition of superior mixing and reverb during development. Tracks from the demo all have an annoying fade-in which is unavoidable both in gameplay and the soundtest. The samples here from the final version are taken from the game and not the soundtrack, as the soundtrack versions sound a little 'remastered'. 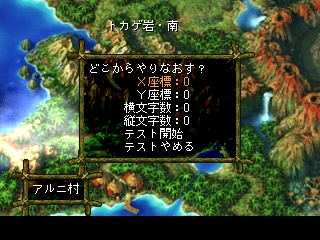 This is played on the demo's title screen as the audio component of an FMV that isn't present in the final at all. 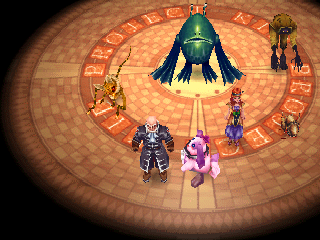 An updated version appeared on the game's official soundtrack. 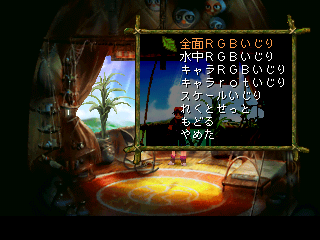 This one can only be heard through the sound test in the debug room. It doesn't loop. The demo version is missing the tambourine and chanting right before the loop. The crash at 0:42 and the echoing percussion right before the loop are different. Also accessible only through the music test. Sounds like there's another note to the bagpipes chords in the final, but it might just be the mixing. 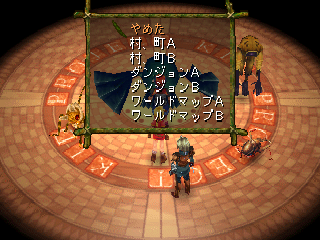 Accessible only through the debug room music test. The guitar sounds a lot crappier in the demo. The sitar was changed (for the better) between demo and final. The instrumentation is completely different. 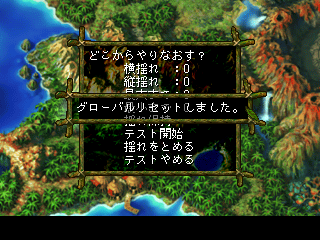 The demo version uses samples that sound like they came from an SNES game. Playing anything in the music test past track 11 will result in a sequence (usually the game over theme) being played with the instrument data of the most recently heard track, or possibly crash the game. 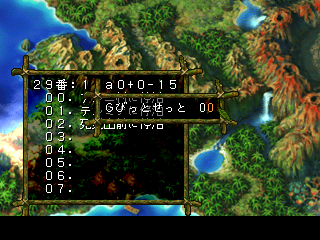 There are some hidden debug functions which can be activated with GameShark. Known codes are unstable, barely functional, and buggy at this point. top window: "ansan, kore yori mae wa arimahende"
Bottom window: 0 Exception to your current space, yannow. Center: Where would you like to restart from? This page was last modified on 29 December 2018, at 14:12.